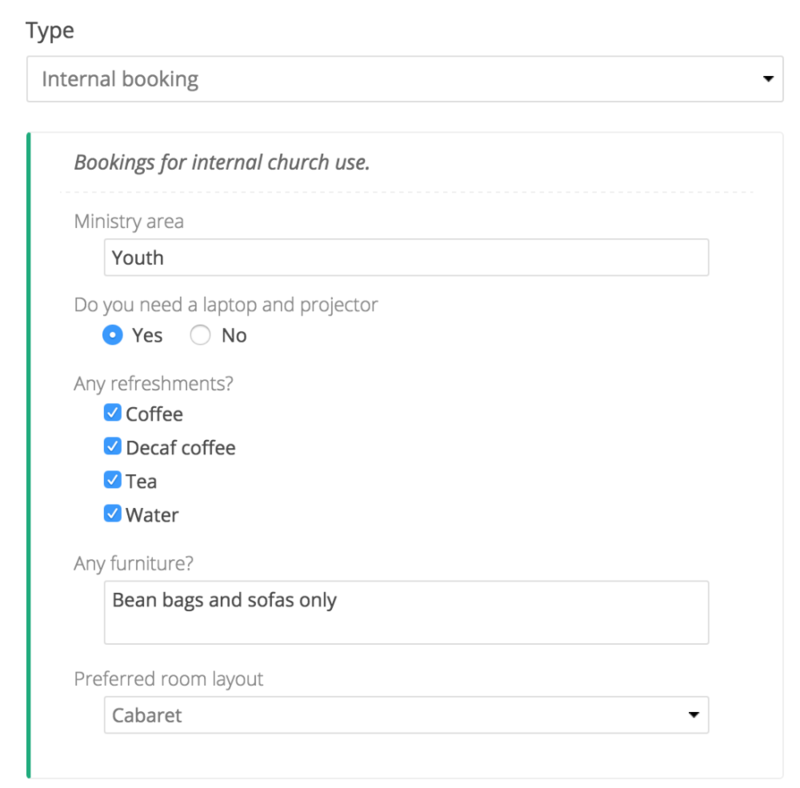 Often a booking made for rooms or resources will be connected to an event or meeting that your church is hosting and has recorded in the Calendar module. ChurchSuite simplifies the logistics of this by giving the option to link these two records. Seeing whether your event has all the resources it needs is now easier than ever! The Calendar module "Events" list shows a visual B icon for those events that do have a linked booking already created. Similarly, the Bookings module "Bookings" list shows a calendar icon next to all unlinked bookings that have been set as visible in the Calendar module calendar, and the "Event" column tells you whether a booking is linked to a Calendar event. To link bookings and events you must first ensure that the event has been created in the Calendar Module. Therefore, begin by first adding your event to the calendar. Once your event has been added (single date or multi-date), open the event page and select "Add booking". If your event is a multi-date event, you will be prompted to select which date(s) in the event date sequence you wish to create linked bookings for. Click "X" to remove any dates for which you don't wish to create a booking for; then click "Confirm". ChurchSuite will now pre-populate your booking with many of the details found in the underlying event. Note, below, how the booking shows as "Linked to an event" and the event name is included. If you are creating your booking from the Bookings module (rather than via the Calendar > Event > Add booking option, as outlined above), then you can find the event you wish to link your booking to using the "Search for event..." field (only visible if "Linked to an event" is selected). ...and Resources associated with the booking for your event. When selecting Resources you have the option of adding optional Set Up and Set Down time. By recording this extra time before and after your booking, you make it easier to schedule adjacent bookings in your Planner while still allowing time in between bookings to make rooms or other resources ready for the next booking. Depending on the custom questions that have already been set up for your booking Types and Resources, complete the booking process by providing responses the the questions listed. Save your finished booking. At this point you will be alerted if there are any issues. Typically these will be to do with required response questions that have not been completed, but it may also be an issue with resource clashes. If this happens, simply scroll down to the Resources section of the booking to see the nature/cause of the clash. In response to clashes, you can either abort your booking and resolve the matter; or you can tick to "Ignore clashes and create the booking?" i.e. to proceed with saving your changes and resolve the clash later. The booking is now added. For multi-date events, a linked booking sequence is created and each event date in the sequence has a linked booking. Once the booking/sequence is saved, you'll be able taken to the booking page for the first date in the booking sequence. The booking sequence dates and linked events are shown in the meta summary column on the right hand side of the page. If you decide at a later day to cancel an event, or need to delete it, ChurchSuite will ask whether you wish to delete the associated linked booking, making tying up loose ends even easier! Simply open the event page of the date you wish to delete and click "Delete" in the top-right corner of the page. You must confirm before an event can be deleted. Type "I CONFIRM" and click "Delete". If the event has linked to a booking, you also have the option to delete linked booking(s). The "Delete" confirmation prompts you to confirm the deletion and the option to delete any linked bookings. If you wish to delete "Past" events, switch from "Future" events to "Past" events and repeat the process of selecting one or more or all "Past" sequence event dates and then selecting "Delete" from the batch "Actions" menu. The above processes for deleting bookings linked to events work in an identical manner when working from within the Bookings module - in other words, when deleting a booking or sequence of bookings, you can optionally delete the linked events from the Calendar module too. For further details on this, see the related support articles below. In busy churches where events and/or bookings can move around, it's possible that users may make changes to the date of an event without correctly setting to mirror the date change in the linked booking (or vice versa). If this happens, linked events and bookings might become mismatched. 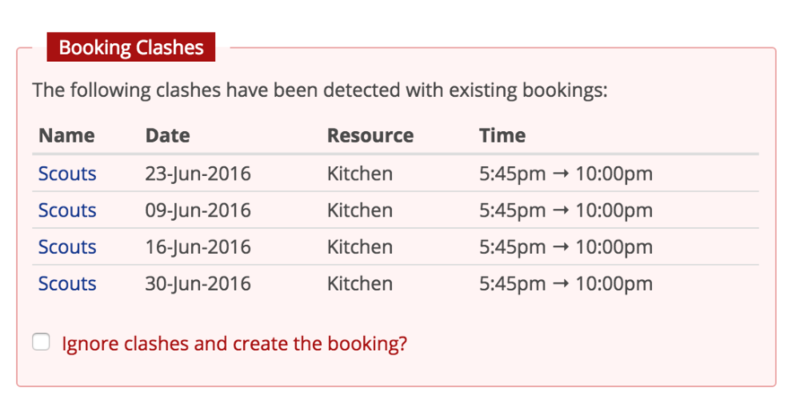 The "Mismatched Events" report found in the Bookings module reports has been designed to provide a snapshot of mismatched bookings and events in a range of dates, enabling you to easily correct mistakes in your data.